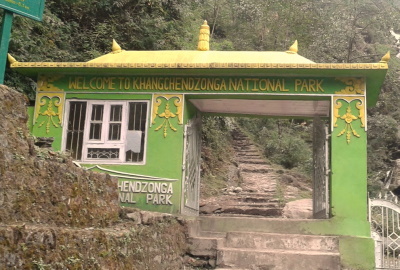 Khangchendzonga National Park is a mixed site known for its glacial mountains and sacred cultural landscape. This Himalayan site includes the 8586m high peak of Khangchendzonga, the 3rd highest in the world. The landscape features glaciers and glacial lakes, and is the habitat of species such as the snow leopard, red panda and Asian black bear. For the local Sikkimese population, the area has important sacred significance. Both shamanic and Tibetan Buddhist traditions are kept alive in this cultural landscape. Flying over this doesn't do it justice. I actually didn't expect to trek into it either because of the distance involved from the towns but in Darjeeling there are many trekking tours advertised. First off you need to get to Darjeeling which a lot of people do easily. They then often continue to Gangtok but I'm quite sure there is no way to enter the park from the north. Well, yes, there is a road at Lachen monastery so you CAN drive into the park but the real way to enter is only on foot. Drive 5h switchbacks to Yuksom and stay another night. The next morning you start ascending to Tshoka. There are actually huts to make camping in November slightly easier. You have already entered the core zone by now but the views are not exceptional yet. Day 2 and it's another half day (too cold to hike early or late anyway). Goal is Dzongri La. The group was very small and we all decided to go up on the next day and then descend again rather than stay for 2 nights. The one day saved makes quite a difference if you spend so long to get here already. It's foggy and cold but so happy to have arrived. In fact that is wasn't very tough but one has to be relatively fit. Spending a week trekking Bhutan and Nepal to get ready really helped. Sure, there are other treks that go much further into the park. Further in you may also be much luckier with spotting animals. P.s. I did not spot a yeti. Viewable from another WHS: Kangchenjunga peak in Kangchendzonga National Park is visible from the Batasia loop on the Darjeeling Himalayan Railway, one of the Mountain Railways of India. Fatal Accidents or 'disasters': Kangchenjunga has seen over 50 deaths since 1905. 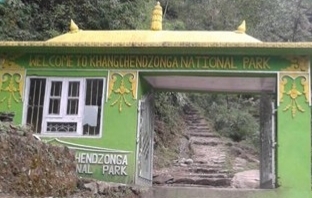 Cultural landscape not recognized: AB eval states "ICOMOS recommends that Khangchedzonga National Park, India, be inscribed on the World Heritage List as a cultural landscape on the basis of cultural criteria (iii) and (vi)."